With everything revolving around the internet today, it’s just impossible to stay away from the network connecting devices, especially internet. Therefore, I would like to introduce you to the top 10 best types of routers review for your consideration. 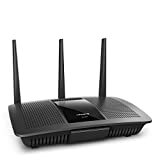 The NETGEAR Nighthawk AC1750 Smart Dual Band WiFi Router (R6700) not only provides the benefit of wireless connectivity, but also monitors and controls the network. Set up is easy. You need no prior experience to handle this one. Expect full 5 GHz coverage in your home with this router in use. You need not to adjust with the dead ends. It could even provide connectivity at the surrounding areas of your house. The Linksys AC1900 Dual Band Wireless Router is undoubtedly speedy. It is a multi-user Wireless router offering the benefit of Multiple-Input and Multiple-Output. Plus, it boasts amazing port selection and a number of management options. However, you find it a little pricy, but the value is worth it. The Linksys EA7500 Max-Stream AC1900 MU-MIMO Gigabit Router offers high-speed dual-band benefit. You can enjoy your favourite game online without any interruption, with multiple contents streaming on other connected devices simultaneously. This model is sure to amaze you with its connectivity speed. The Nighthawk X4S AC2600 Smart Wi-Fi Router supports MIMO. This feature boosts the internet speed for Wi-Fi clients that are supported in a crowded home. You are not going to face any hassles with heaving uploading and downloading on having this device. To its downside, this Wi-Fi model shares bloated Web interface like its predecessors. 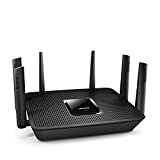 So this may be an ideal pick for the ones who are used to connecting external hard drives to their routers. It will affect the network storage performance. Nevertheless, it can efficiently handle a dozen of devices at once. It leaves no dead ends at a large home covering 4,000 square feet area. The TP-Link Archer C1200 is packed with a number of smart features that make it one of a kind. It comes with all the basic features that one looks for a simple and reliable router. Operational from a smartphone app this internet-connecting device comes with a modern hardware that boosts its connectivity power. However, it’s a dust magnet and fingerprint router, but that doesn’t make it worthless. The speed it generates on 5GHz wireless network is remarkable. Moreover, it can be fixed on walls. This one lets you save space yeah! With 253Mbps upload speed and 152Mbps download speed the Linksys Max-Stream AC2200 is yet another perfect Wireless router. You can expect an extremely high performance from this system. It’s worth it for futuristic homes as it includes future-proofed specifications. It benefits the users with seamless connectivity on a number of wireless devices at the same time. You can easily connect almost 15+ (could be 2 PC’s, 5 smartphones, 2 tablets, 2 laptops) devices at once. This smart Wi-Fi router offers steady and impressive range for running multiple devices at the same time. It comes with 1GHz dual core processor, which makes it an optimal choice for mobile devices, streaming music/videos, and gaming. The NETGEAR Nighthawk AC1900 boasts dual band- 2.4GHz offers 600 Mbps speed, 5GHz gives 1300 Mbps speed. It is equipped with five Gigabit Ethernet ports facilitating the users to hardwire Blu-Ray players or gaming console. You can reap the benefit of uninterrupted gaming, browsing or streaming with the Nighthawk in use. The adjustable external antennas added to this router boost the signals to a greater extent. This Linksys Wi-Fi Tri-Band Router can easily connect over 20 devices. Arlo Cameras, iPads, Rokus, laptops, Xbox, 2 4K HDTV’s- you can run all these and much more with this device. It even facilities the users with speedy transfers (of around 900 Mbps) on wired clients This Wi-Fi router gives great speed all over a house constructed within 3000 sq. ft. area. You can even stream music at your neighbours using this system. That’s pretty cool yeah! With the capacity to hit an 802.11ac rating this TP-Link Smart Wi-Fi Router has upped the performance game. It gives a great value for money by doing 802.11ac at bandwidth rated up to 1300Mbps, and 802.11n at 600Mbps. Plus, it comes with has three removable external antennas that offer great support as expected. The MAC address filtering feature, Guest Zone support and beamforming technology make it even more reliable device. This user-friendly alternative to home wireless coverage is the next best “crop” in the line. 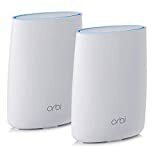 With high-end satellite and router, this Orbi system offers enhanced management and LAN connectivity options to the users. 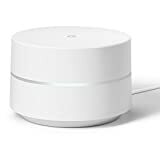 It’s smart, fast and offers high speed internet connectivity to all the corners of the house (some Wi-Fi routers lack this feature). It can provide strong wireless connection The Tri-band delivers optimum speed irrespective of the number of devices connected to it. This cheap pricing Wifi system is totally worth its price. You just need 15 minutes to set up its units. It offers top-sustained speed that ranges over 470 megabits per sec. It’s a perfect buy for the ones looking for an elegant and simple Wi-Fi system that uses user-centric app. The Bluetooth smart ready feature adds another star to its capabilities. The added advantage of wired backhaul enhances the overall worth of this Google network connecting system. So, find your favorite one? I hope you do!